Microsoft released its Surface Pro 6 device on October 16th and it is has been highly acclaimed as one of the best 2-in-1 laptop and tablet combinations available on the market. Here is a breakdown of the specifications and the pros and cons of the Surface Pro 6. The Surface Pro 6 comes with a Core i5 processor, 8GB of RAM, and 128GB of storage. The base model Surface Pro 6 starts at $899. If you want to use the Surface Pro 6 as a laptop, then you may want to buy the Surface Type Cover for $129.99. Without the Surface Type Cover, the Surface Pro 6 works as a tablet. Microsoft also sells an Alcantara fabric cover for the Surface Pro 6 for $159.99. The color options include blue, red, and silver. And you can also get a black Surface Pen for $99. With some of these accessories, this would set your purchase of the Surface Pro 6 at well over $1,000. The Surface Pro 6 has a 12.3-inch PixelSense display at a 2736 x 1824 (267 PPI) resolution. And the Surface Pro 6 has a Mini DisplayPort, a single USB 3.0 port, 3.5mm headphone jack, a microSD card reader (located under the kickstand), and Surface Connector for charging. The front-facing camera is 5-megapixel with 1080p Skype HD video support. And the rear-facing camera is 8-megapixel with 1080p full HD video. Inside of the Surface Pro 6 is an 8th-generation quad-core Intel processor to provide a speedy experience. It is especially impressive that Microsoft was able to place a powerful Intel Core i7-8650U processor in a device with a light and thin design. Plus the Surface Pro 6 has 8GB of RAM by default. This makes app launching and multitasking features faster than ever before and it is a big step up from the 4GB included in last year’s model. A number of reviews have also highlighted that the Surface Pro 6 is relatively quiet. In various testing cases, the fans inside of the Surface Pro 6 did not fire up. One of the most underrated features on the Surface Pro 6 is the 12.3-inch PixelSense display. Since consumers often use their Surface devices for hours at a time, the brighter and sharper screen makes watching videos and flying through productivity tasks a much more pleasant experience than before. It’s also worth mentioning that you can still see the display in direct sunlight, which is something you do not get with other tablets and PCs. One of the best Surface Pro 6 features is its lightweight design. With an i5 processor, it weighs only 1.7 pounds (770 g) and it is only 0.03 pounds more with an i7 processor. Even though USB-C ports are becoming ubiquitous, the Surface Pro 6 lacks them. Since Microsoft integrated USB-C ports into the Surface Book 2 and Surface Go, this comes as a surprise. The Surface Pro 6 does not have ThunderBolt 3 support and you cannot connect an external GPU to it either. And without the ability to connect an external GPU, you should not expect to be able to play graphics-intensive games on the Surface Pro 6. At a price of $899 for the base model, this is a $100 price increase from the base model last year. But this higher price gets you more RAM and a better processor. Fortunately, Microsoft introduced the lower cost option for Surface Go device this year if you are on a budget. Another notable change that The Verge highlighted is that the Surface Pro 6 ships with Windows 10 Home edition rather than the Pro version. To upgrade to Windows 10 Pro for your Surface Pro 6, it will cost you. For some consumers, it may worth paying to upgrade to Windows 10 Pro for features like Remote Desktop and BitLocker encryption. 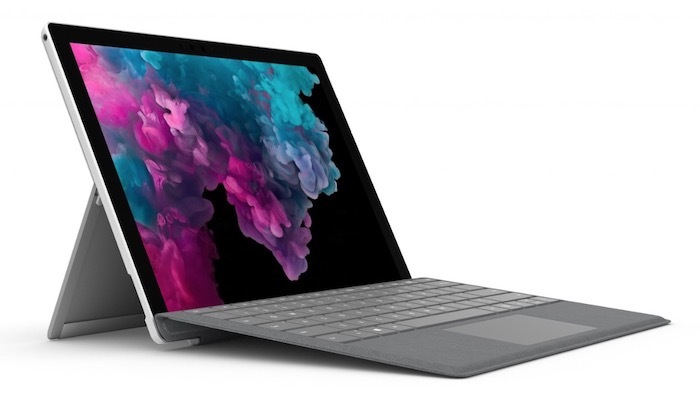 The Surface Pro 6 has a repeated design, meaning it looks just like last year’s Surface Pro. And last year’s Surface Pro looks just like the Surface Pro 4. While some consumers may appreciate this level of consistency, it may have been worth it for Microsoft to take some risks with noteworthy design changes besides adding the matte black color option. Even the camera specifications are about the same as last year’s model. And the new matte black option is only available with the $1,199 256GB storage model. According to the official specifications, Microsoft said that the Surface Pro 6 supports up to 13.5 hours of local video playback. Even with heavy usage, the Surface Pro 6 averages at a bit more than eight hours. This should be good enough to last you the whole day before charging it up again.